Waxing and waning. Bleeding and birthing. Emptiness and fullness. Light and shadow expanding and contracting constantly—although at first they may seem like strange bedfellows, the moon and the serpent have much in common. Many people are quite surprised to learn that within the Sanctum, our serpents align the shedding of their skin with the monthly bleeding cycles of the women who care for them. Although this shedding may shift in relation to the phases of the moon, depending on our lifestyle and the health of our bodies, generally speaking our serpents (and ourselves) shed and release on the full or new moon. This shedding process can be smooth or difficult, and we take great care to tend to ourselves and our serpents when this special time approaches. As sensitive energetic beings, we are constantly receiving subtle signals from the earth, the stars, the moon, and the myriad beings around us. These quiet messages teach our bodies when it is time to shed and release, making way for new seeds and new life to be grow. These same signals are received by our serpents, who smell the hormones in our bodies as well as receiving nature’s other signs. Small wonder we shed together! 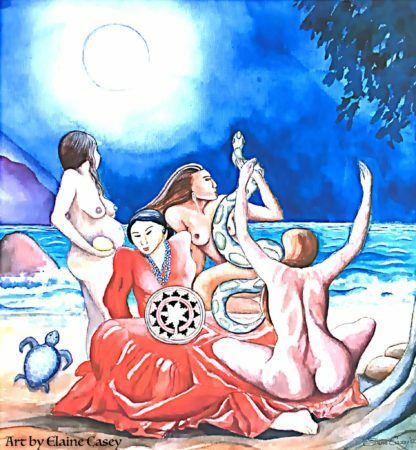 This deep attunement between women’s bodies & nature’s cycles may have played a part in the tradition such as the Red Tent, where women were revered as womb-bearers & mothers of life, associated with the moon and its powerful energies, and the secrets of the womb mysteries passed down from mother to daughter. During their time in the Red Tent, women did not work as heavily and tended one another gently to support easy and painless bleeding, helped one another give birth, secretly performed abortions and other family planning, and channeled the power of their moon time by creating beautiful things and sharing the songs and stories of the Red Tent. Women also followed the phases of the moon to decide when to plant and harvest in alignment with these natural cycles. Perhaps this connection between moon, women, and Serpent has existed since before human memory. Modern pagan and women’s empowerment movements have embraced and reimagined the ancient tradition and ritual of the Red Tent, and hundreds of thousands of people today celebrate the connection between moon & womb. 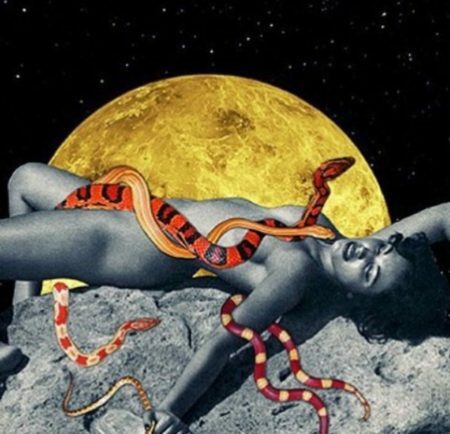 Within the Serpent Sanctum, we too honor our connections to nature’s cycles—and in addition, we are fortunate to also carry the connection between womb, moon, & Serpent in a special way. We are delighted to be joining with Antonieta Hensley, a Red Tent facilitator who has hosted thousands of gatherings across the United States, to share this special vision through our first New Moon Red Tent. Together, we will gather with those who identify as women or who have experienced monthly bleeding cycles to share with each other our moon & womb wisdom medicine. Serpent Sanctum also believes and recognizes the divine feminine & masculine energies in every body, and we are honored to be deepening and honoring the connection between moon, womb, and serpent by joining Aya Iwasaki of AyaPapaya for the first ever co-ed Serpent Moon retreat, which will take place from Nov 8-11 in Shasta, CA. This retreat will be open to all who wish to explore the womb mysteries, moon magic, and the power of the Serpent as never before. If you feel a connection to the sacred cycles of the Wild, this retreat will offer incredible tools for empowerment, unleash your sacred sexuality, and deepen the power & pleasure you feel in your life. Space is limited, so reserve your space soon as we expect the container to fill completely. We welcome you to our Serpent Moon tribe!